Have an old car taking up space in your driveway? Donate it to Goodwill Industries of Southeastern Wisconsin! Donate your car, truck, RV or boat to Goodwill Industries of Southeastern Wisconsin and help support a variety of programs, resources and education for your community! We make it easy for you to donate with your free scheduled pick-up, and you may even qualify for a tax deduction! Get Your Donations Ready ... The Pack'er Up Donation Challenge is Going On NOW! Get the entire family involved! 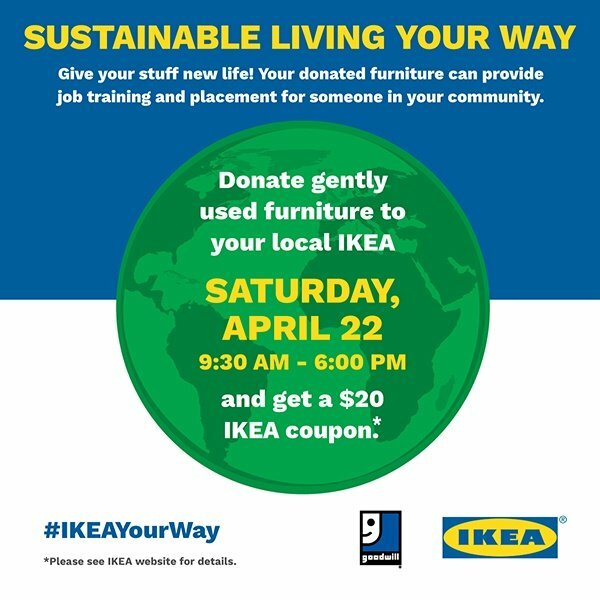 Clean out your closets and go to any participating Goodwill Store & Donation Center between Sunday, April 1st and Monday, April 30th, 2018. Simply indicate your school name, city and number of items donated on the slip provided to you by the Goodwill Donation Attendant, and the school with the greatest number of items donated will receive a visit from Donald Driver. Open to elementary and middle schools in the southeastern Wisconsin territory only. Clear the Zone! The Pass It On Donation Challenge is Going On NOW! Face off your clutter ... clear the zone ... clean out your closets! Get the entire family involved in gathering gently-used clothes and household items, then go to any participating Goodwill Store & Donation Center between Sunday, April 1 and Monday, April 30, 2018. Simply indicate your school name, city and number of items donated on the slip provided to you by the Goodwill Donation Attendant, and the school with the greatest number of items donated will receive a visit from a Chicago Blackhawk player. It's that easy! Open to elementary and middle schools in the metropolitan Chicago territory only. That's right, it's time to donate and save during the Goodwill Sale running March 14th through the 24th! Customers will receive a Goodwill Sale coupon for every item they donate at any Boston Store, Younkers or Carson Pirie Scott. Shop & Save During the Goodwill Sale! That's right, it's time to shop and save during the Goodwill Sale running September 13th through the 30th! During that time customers will receive a Goodwill Sale coupon for every item they donate at any Boston Store, Younkers or Carson Pirie Scott. 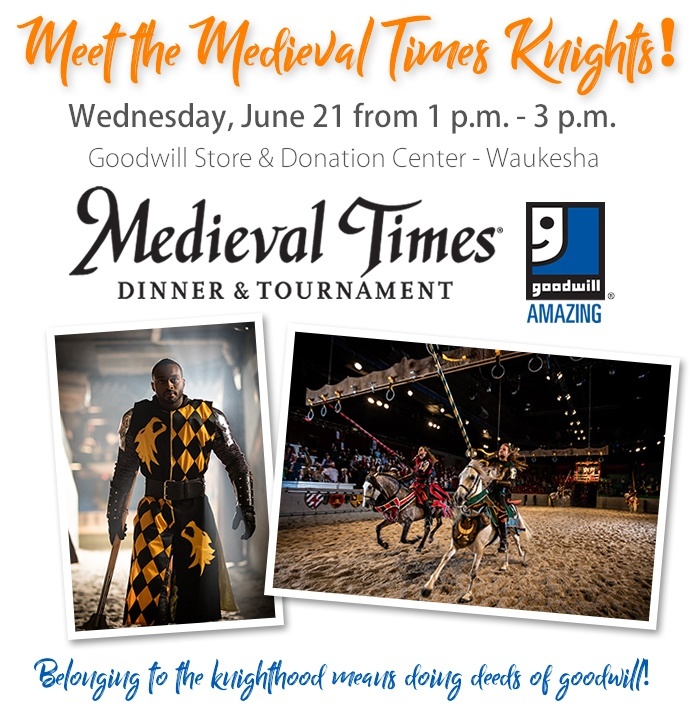 There will fun for the entire family as the Medieval Knights unload donations, discuss the knighthood code of ethics, as well as conduct and demonstrate a duel from 1 p.m. to 3 p.m. on Wednesday, June 21 at the Goodwill Store & Donation Center in Waukesha (1400 Nike Drive). Operation E-cycle Going on This Weekend - Rain or Shine! Do you have an old computer or two in the basement? Not sure what to do with your old tablets or phones? Do you have a gaming system that you no longer use? 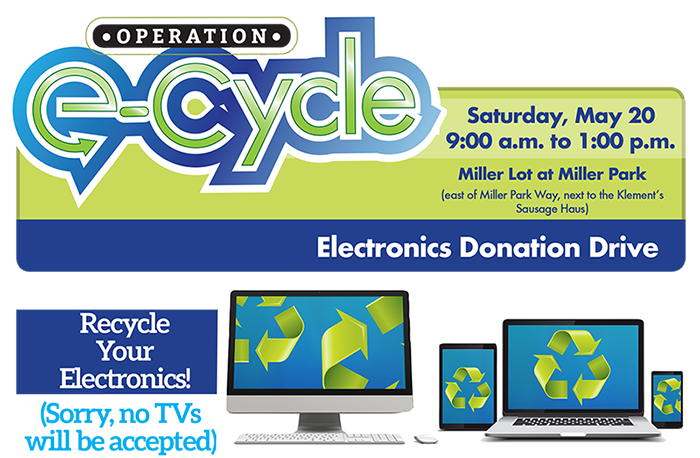 Bring it to Goodwill E-cycle at our Operation E-cycle Electronics Donation Drive on Saturday, May 20th. Launched in 1970 to bring attention to environmental issues, Earth Day is a time to promote earth-friendly practices such as recycling and sustainable living. We all do our part in recycling small items -- bottles, newspapers, cans, and so on -- but what about the larger things? Unfortunately, due to furniture’s unwieldy size and materials, it can be challenging for consumers to find responsible and easy solutions for recycling these larger household goods. Happy Easter! We will resume our regular business hours on Monday, April 17. Get FREE delivery of your bedroom purchase and FREE pick-up of your donated pieces when you make a bedroom purchase of $1499 or more at Steinhafels, and donate two-to-five bedroom pieces to Goodwill!